How flexible is flex pvc? See for yourself in the pictures below. You can also see the minimum bend radius on our home page. Call the number above to buy or ask questions. 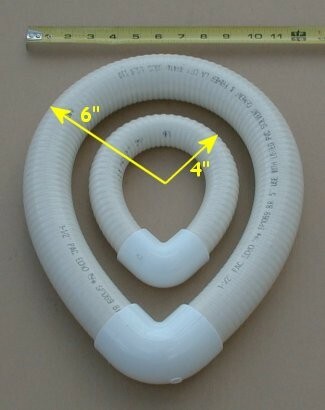 Click on the logo above to go to our home page with prices for flexible pvc pipe. We stock 1/2", 3/4" 1", 1.5", & 2" by the roll and by the foot, and 3", 4" and 6" flex pvc pipe by the roll, 4' sections and 8' sections. The larger sizes are not as flexible as the smaller sizes. An 8' section of 3" flexible pvc pipe can be bent back on itself and easily form an egg or teardrop shape. An 8' section of 4" flexible pvc pipe can be bent to about 90 degrees by hand, more with some determination and power equipment. The 6" by 8' section can go to about 45degrees by hand, and 90 degrees with power equipment. All pipe is glued using traditional PVC pipe cement and primer. We recommend medium to heavy bodied glue and any standard primer. 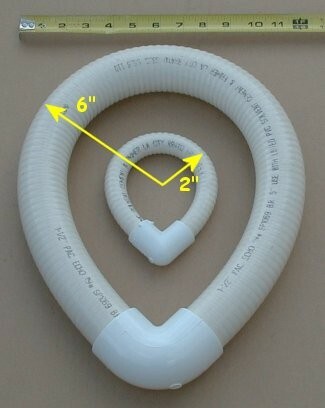 This pipe can be used for swimming pools, spas, hot-tubs or whirlpool bathtub projects. It works great for gardening, irrigation, fountains and ponds. While it's true the initial pipe cost is higher than that of rigid pvc pipe, the time saved and reduction of needed fittings will bring the job in at about the same cost. It cannot be used for potable water situations, nor in any situation that has constant dead head pressure. It can be used for drainage and water collection as well. Application Guidelines: Flexible PVC Pipe should not be used in conditions of constant pressure exceeding the working pressure specifications. There should always be a flow through the pipe. Constant "dead head" pressure will balloon the pipe and eventually it will fail. Please keep this information in mind when selecting flexible PVC pipe for a project.